Katja's blog (here) has been my new favorite daily read lately. She is always creating such cutie things and I always feel inspired to make things after I check it out! In fact, she inspired me to knit a ton of hairbows a couple of weeks ago with her cutie tutorial. 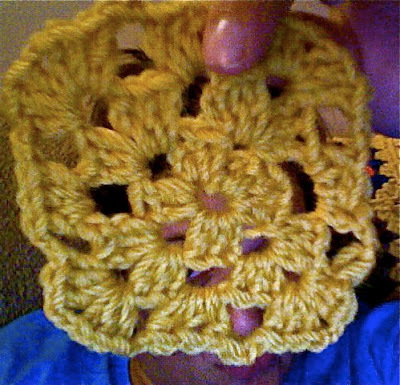 Check out my very first "official" granny square!!! You have nooooo idea what a great accomplishment this is for me. I seriously have had about 30 failed attempts in the last month. Seriously, you have no idea how happy this makes me!!! 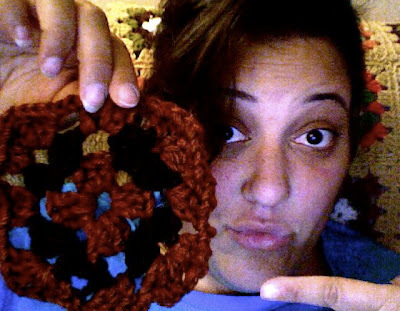 I'm so excited for your granny square! Yay Janel! They look so pretty! I got my colors today to make my project from the class. Can't wait to see your finished product! first of all: it's so great you finally made it! i wasn't sure if i explained it well, but now i know, it works. Woo hoo! Well done! It is a great tutorial too. soo cool! i've been wanting to make a granny quilt so bad. you did it....so proud of you. now you can makes thousands! wow o wow o wow!!! you rock!!!!! yay!!! yayayayay! i knew you could do it! they look great! !